For the past month, you’ve probably seen lots of flyers posted in the Band office and around Biigtigong inviting community members to take part in a very hope-filled Biigtigong Aadsookaanan Reconstruction meeting which took place on March 15th in the Lands & Resources building. Our ancestors have left us the gift of our sacred stories. We call these stories ‘aadsookaanan’ in our Biigtigong dialect of Nishnaabemwin. 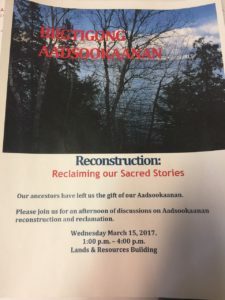 On Wednesday, March 15th, 2017, this community informational meeting on aadsookaanan reconstruction was a first step for us as Biigtigong Nishnaabeg to begin reclaming our sacred stories. This meeting was a series of insightful discussions, led by Biigtigong Elders, about our unique Nishnaabe worldview which has been passed down to us through many, many generations of aadsookaan storytelling by our people. The strong support from our Elders at this meeting inspired us to officially begin our aadsookaanan reconstruction the very next evening. So, on the very next evening, Thursday, March 16th, following a pipe ceremony by Collette Goodchild, and several hours of serious discussion about our need to transfer our Nishnaabe worldview to our next generations, our Aadsookaanan Team was formed. Thursday’s ceremony included heartwarming discussions of our fondest of memories listening to our grannies and to our grampas sharing these aadsookaanan – these sacred stories – with us when we were very young. Thursday’s ceremony was also a sometimes-sad discussion about how so many of our stories have been destroyed and eliminated from our communities by generations of colonization and disrespect by the newcomers to Turtle Island. Perhaps most importantly, though, our time together on Thursday, March 16th, was a motivating and educational sharing time about how we, as Biigtigong Nishnaabeg, plan to reconstruct and once again tell these sacred stories in our Biigtigong dialect to all of our children. We invite you to learn more about our community’s aadsookaanan reconstruction initiative by heading over to our Aadsookaanan Project webpage. We warmly extend an open invitation to all Biigtigong community members to join us in the upcoming meetings about the reclaiming of our sacred stories. We hope to see to there!